If you are in need of direct aid, click find food near me to search Maryland Food Bank partner network food pantry and soup kitchen locations nearest to you. 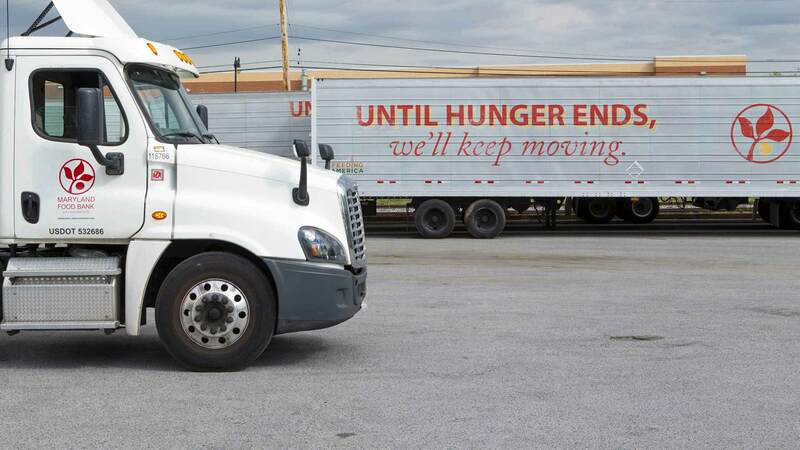 With 93,000 square feet, the Baltimore warehouse is the central hub for food distribution to central Maryland, as well as our branches in Western Maryland and on the Eastern Shore. The Baltimore office holds more than 100 employees — about 85% of the food bank’s total workforce — and houses the majority of the Maryland Food Bank’s statewide campaigns and initiatives. In 1981, the Maryland Food Bank opened a branch in Salisbury in order to better serve the rural populations of the Eastern Shore. In its first year, the branch distributed about 33,000 meals. In FY 2018, the branch distributed more than 5 million meals to food-insecure Marylanders. Wednesday: 10:00 a.m. – 2:00 p.m.
Thursday: 12:00 p.m. – 4:00 p.m. Since opening in 2012, this branch of the Maryland Food Bank has been able to significantly increase food distribution and provide more access to food aid in Western Maryland than ever before. To get information on planned giving, memorial or tribute gifts, bequests, IRA, donor advised funds, stock gifts, or other forms of giving at the estate level, reach out to Maryland Food Bank special giving program coordinator Laura Urban. For information on participation or partnership in Maryland Food Bank programs such as School Pantry, DSS, Foodworks, My Groceries to Go, Pantry on the Go, Summer Clubs, and Supper Clubs, reach out to a Program Coordinator. If you or somebody you know may be eligible for low-income household food assistance through the federal SNAP benefits program, but are unsure of how to register, or need a trusted source of information, reach out to a Maryland Food Bank benefits coordinator. Food distribution, programs, campaigns, and educational outreach at the Maryland Food Bank relies on the philanthropic support of charitable individuals like you. We hope you’ll consider a contribution.